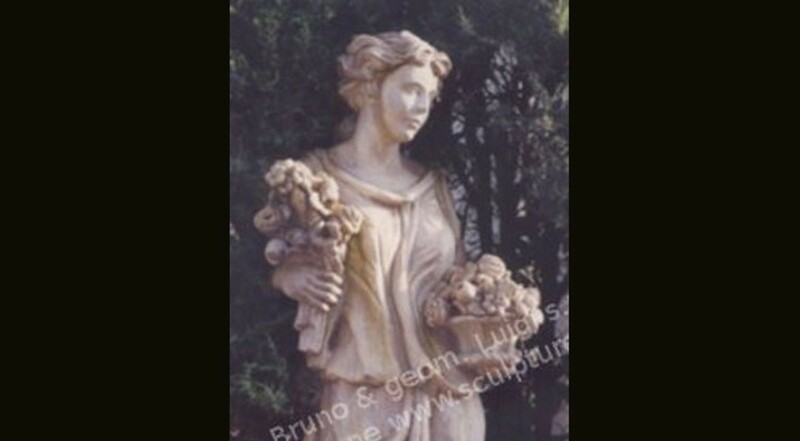 Hand carved Four Seasons statues for landscape and outdoor decoration. Spring is shown with profuse flowers because it is the season when most flowering plants blossom. Summer holds a sheaf of wheat and wears a cloth headband to illustrate the labour and product of the wheat harvest, which is done in the summer. Wheat can either be planted in the winter to be harvested at the begging or very end of summer, respectively. Autumn is the season in which most fruits become ripe. Since grapes are harvested in the fall, wine also is made in the fall. This is alluded to by the goblet. Winter is shown without produce and striving to warm himself because the temperate winter is cold and rather.